Mandrake is a relative of the tomato and potato, but you would hardly guess that from seeing this large, ground-hugging perennial plant... unless it had already flowered and was producing its tomato-like fruits. 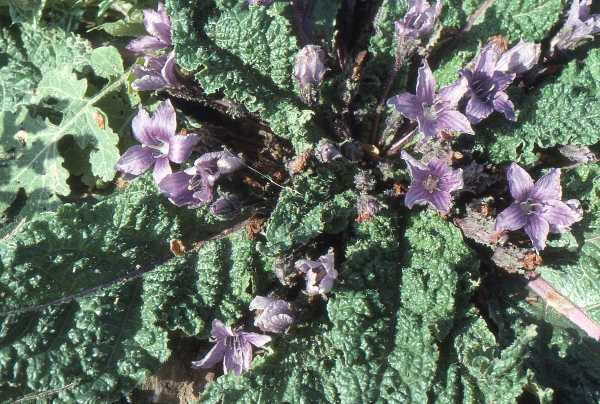 Mandrake has a ground-hugging rosette of large shiny green leaves up to 40cm long and densely-packed mauve or violet five-petalled flowers 4 to 5cm across. The fruits, which are initially initially green, ripen and turn yellow or orange and look like tiny egg-shaped tomatoes. 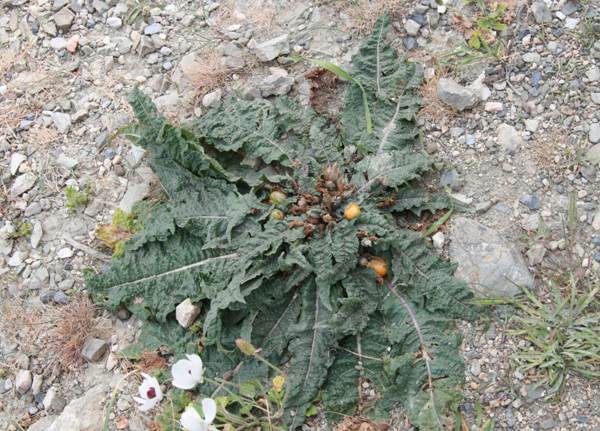 Apart from lying at ground level rather than growing on a prickly bush, the fruits of Mandrake might easily be mistaken for the yellow-orange (and seriously poisonous) fruits of Apple of Sodom Solanum linnaeanum. Mandrake can be found throughout much of southern Europe and in particular in the eastern Mediterranean region; however, it is not common. 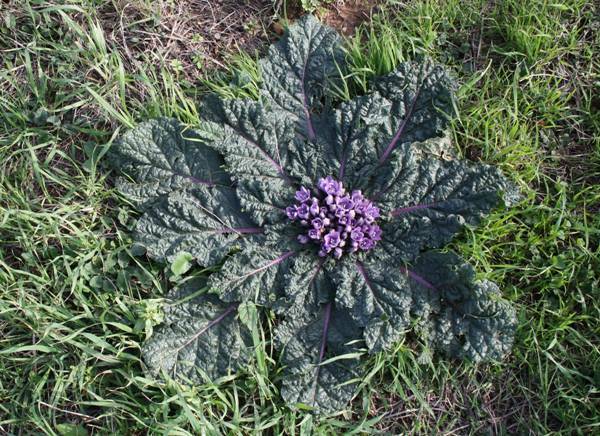 This plant usually grows in waste ground and other stony places both inland and on the coast. 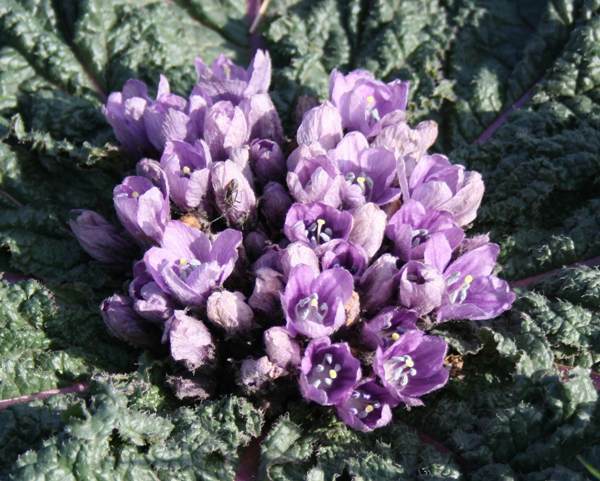 Mandrake flowers usually appear from September to December but sometimes also in the spring. Mandragora, the generic name, is a reference to the Mandrake of myths and legends. Mandrake plants have roots that resemble the human form and are rumoured to let out shrill screams when they are being pulled out of the ground. Shakespeare wrote In Romeo and Juliet: Shrieks like mandrakes' torn out of the earth. The specific epithet autumnalis relates to the usual time of year when these plants produce their flowers. Other common names that have been applied to Mandragora autumnalis include Satan's Apple, Devil's Apple, Devil's Herb, and Elephant's-ear. Mandrake is far from common, perhaps largely because of the tradition of gathering it either as a source of poisonous narcotic drugs or in the long-held belief that it has the ability to enhance human fertility. The roots contain mildly poisonous alkaloids and have historically been used in the treatment of pain and to alleviate sleeplessness; however, all parts of this plant must be treated as poisonous since it is a close relative of Deadly Nightshade Atropa belladonna and contains the same kinds of deadly poisonous chemical compounds. The fruiting plant shown above and the flowers seen on the left was photographed in Crete in early April. Synonyms of Mandragora autumnalis Bertol. include Mandragora officinarum L.
Two picture at the top of this page were kindly contributed by Simon Harding.